Bengali recipe « Bong Appetite..
Bengalis are known as the sweetened lot.People who speak a sweet language called ”Bangla” ,people who can act sweet(read ‘nyaka’ or overtly coy)if they wish to and people who love their sweets to death.Well to tell you the truth these rendezvous of Bengalis with sweetness, as a youngster living in Kolkata(nee’ Calcutta) always made me feel sweets are overrated virtues of Bengali cuisine.Any non-bengali I have met from outside Kolkata have started or ended their conversation with me as ”Do you like roshogolla ,mishti doi?” or ”Oh! I love mishti doi” .Come on there’s so much more in Bengali cuisine than just sticking with this eerie affinity for mishti(sweets) .But as they say as you grow up(read grow old) your mind tends to be less rebellious and more grounded to reality.Staying outside Kolkata have now knocked some senses in me that cliches are cliches for a reason.Nothing can beat Mishti doi in popularity.It is the Amitabh Bachchan of Bengali cuisine.The ultimate showstopper.Time tested,survived all the competitions and travelled across the country as the brand ambassador of Bengali cuisine,you have no other choice than to love this sweetened yogurt,very typical of Bengal and some other regions of eastern India. 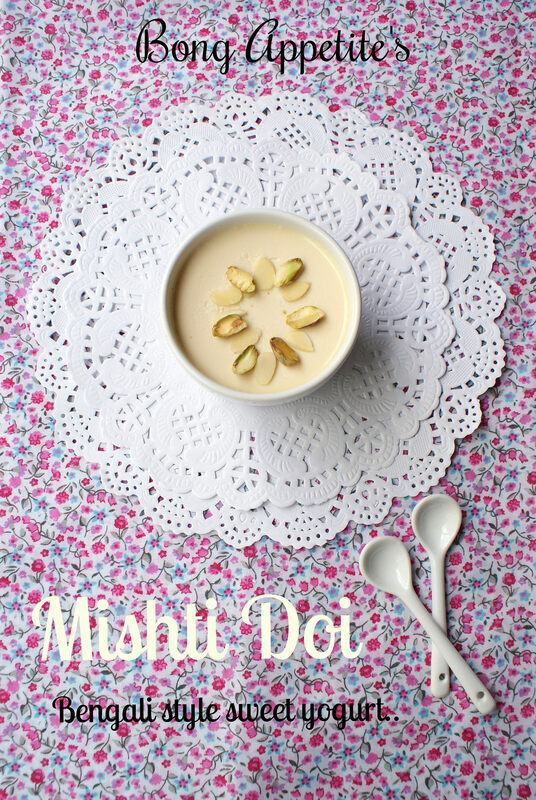 The term mishti doi for me conjures up a memory of a chilled earthen pot filled with a slightly pink colored sweetened yogurt,with a thick layer on top,creamy when spooned out yet well set in the wet earthen pot.With the spoon I would happily make an indent in a corner of the doi in the earthen pot and lick the spoon up with closed eyes.As a kid I was intrigued by the slightly pink colored yogurt and always wondered why we nicknamed it lal doi(red yogurt) and not golapi doi( pink yogurt).May be we are a color-blind lot! 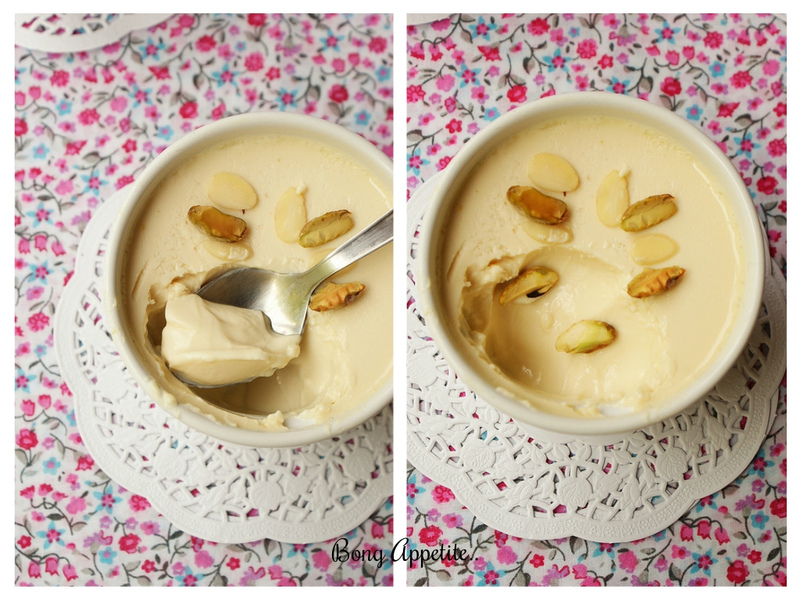 The art of making this yogurt, has hardly ever crossed the threshold of the Bengali sweatshops and not entered the Bengali kitchen until recently probably because the traditional process of making mishti doi is bit time consuming than making the white yogurt variety at home. 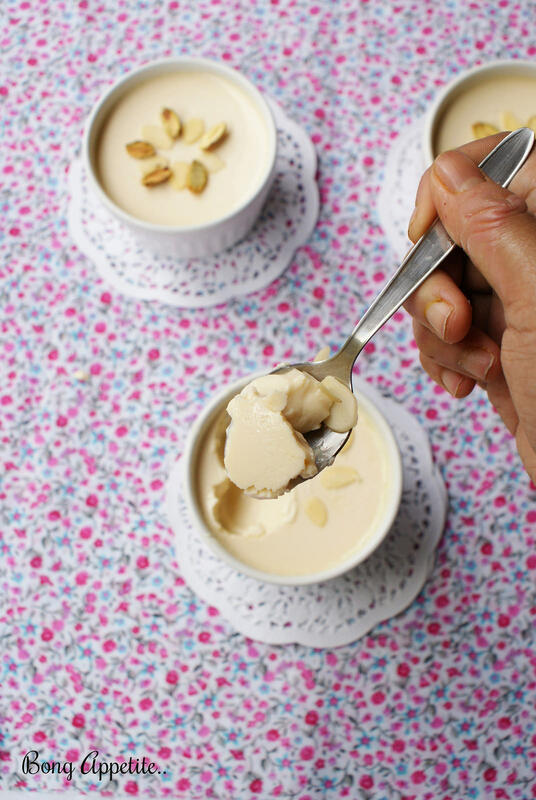 The traditional preparation of mishti doi calls for caramelizing the full fat milk with sugar or jaggery. The thickened milk is then set to ferment overnight in a pot along with a some fresh yogurt which works as culture for fermenting.Earthen pots are traditionally used to set this yogurt as the pot allows evaporation of water through it’s pores allowing the yogurt to set in the perfect temperature.Phew ! Thankfully every long cut has got an equal and opposite short cut! Trust me on my take of the Newtonian law.I prefer shortcuts that gives splendid results without compromising on the quality.And this is how I do my mishti doi . 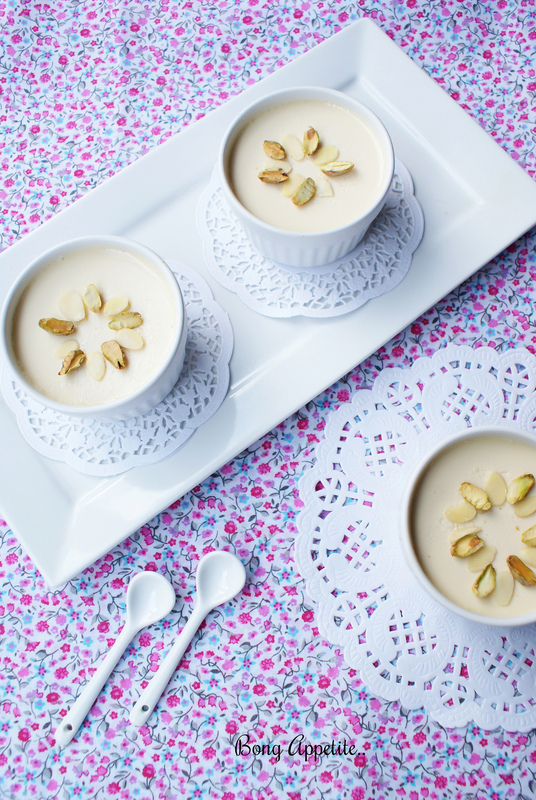 Stop Press : This yogurt tastes even better,more creamy and decadent a day later ! Additional step : If using full fat milk instead of canned evaporated milk ,heat milk in a heavy bottomed pan,stirring continuously till the milk is reduced to almost 40 % of it’s original content(removing 60% of the water content in the milk) . Remove from the heat and let it cool at room temperature. 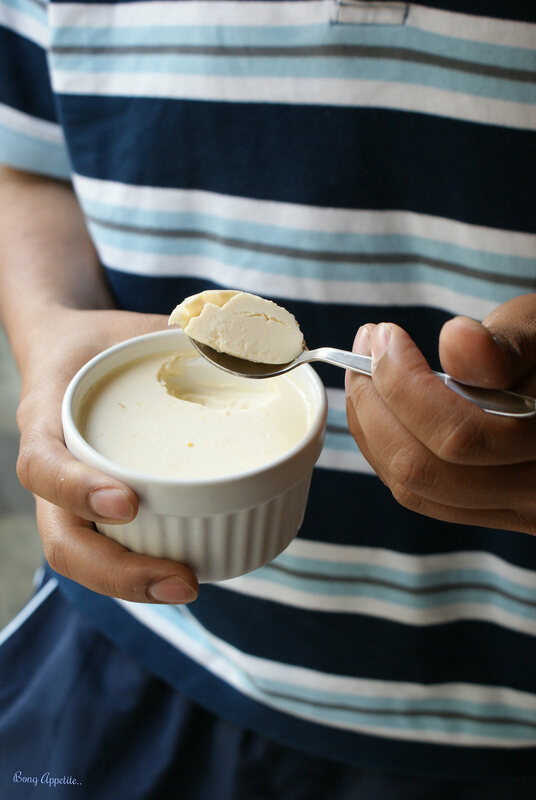 In a large container mix the condensed milk,the evaporated milk or the thickened reduced milk and plain yogurt. Whisk the contents of the mix ,till there is no lump. Pour the mixture in a baking container of your choice. Bake at 180 C for exactly 15 minutes and then turn off the oven. Do not open the heated oven and let the yogurt seat there and cool down slowly for at least 6-7 hours or overnight. Remove the set yogurt from the oven,cover with a cling film or aluminium foil and put it in the fridge.